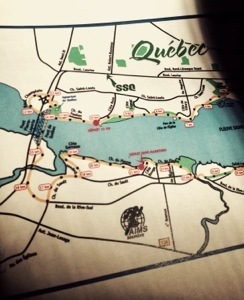 The actual Marathon des Deux Rives in Quebec City wasn’t that far off from what I had predicted. I had awoken before my alarm clock. I ate a good breakfast. Drank an adequate amount of coffee. I was dressed and on my way to the ferry as the sun was coming up. On the way down, I met a woman from Wellesley also running the marathon. Small world. I arrived at the start in Lévis with plenty of time to stretch, eat some more, go the bathroom a few more times. I stashed my gear in the truck and ran around the parking lot to warm up a bit. The only drama was finding a last-minute piss spot. There were officials warning the runners away the more natural spots and into the long lines for the portos. There wasn’t going to be enough time for that, so I had to tramp through the tall grass to get to a spot that was hidden enough. Glad I did. Then we were off. About 2,000 runners taking the start with 42.2 km (26.2 miles) ahead of us. I had been training in kilometers all summer which was good because the course was marked in kilometers — and only kilometers — so all the markers and timings made sense. I eased into the first few kilometers. Checked my watch for pace and a heart rate. The pace was good — about 4:15/km (6:50/mile). The heart rate was garbage — sitting about 78. After a few minutes it caught up to the 140’s. I tried to find a group that was running close to my pace. But they all seemed to be going too fast or too slow relative to what I wanted to run. Not that I knew. This was my first marathon and I was unproven running at speed over this distance. After 3 km, I picked the pace up to 4:00/km. My heart rate held steady in the mid-150’s. The sun was up. It was still cool. There was a light breeze. This felt good. This felt sustainable. At 35 km to go, I told myself, “I’ve run this far before. I can handle it.” I kept the pace steady, between 3:55 (6:18) and 4:05/km. My heart rate held steady. I was taking drinks at every feed. I was eating every 30 minutes. I was fueling up and banking time. My legs felt good. None of the twinges in my calves, feet, hips or hamstrings that had plagued my summer distance runs. Along the bike path by the river, I found myself running alone into the wind. It didn’t feel smart. So I eased up and let a group catch me, then tucked into the back of them. They were running a bit faster, closer to a 3:50/km pace, but it still felt doable. Everything was going well. For the most part. What follows is an account of how I’d like to run my first marathon. There is a technique in sports psychology called ‘visualization’ where you imagine the event in an effort to prepare yourself mentally and to improve your performance. I’ve never been very successful at visualization, usually prefering to wait until the last minute to reckon what I’m about to get myself into. In years past, in the bike racing years, the visualizations always went off track and ended up involving miraculous feats of strength and, utlimately, girls. In short order, I will write the true account of my Quebec City Marathon. The drive up to Quebec was uneventful, through New Hampshire and Vermont, across the border and all the way across Canada. I had done this drive in the winter to go to our annual ski camp at Mont-Sainte-Anne. And would be doing so again in a few months. The snow-free roads, leafy trees and extra daylight were preferable to the cold, wintry conditions. On Saturday, I ran a few easy miles, scoped out the finish, picked up my race packet. Ate more carbs. Rested. I was finally feeling recovered after that 22-miler training run but it had taken nearly two weeks and on the eve of the race, I was still concerned about how successfully I had recovered. I pinned my number to singlet. On race day, I woke up earlier than my alarm. I ate half a peanut butter and honey sandwich. I drank some coffee, de rigeur. I lubed up my feet and other body parts that would otherwise get rubbed raw or blistered. I stretched out. I rolled my legs and hips. I listened to music and relaxed. I wrote “Romeo” on my arm in black Sharpie. Then I headed out of the hotel, down to the ferry, then to the bus and eventually to the start. It was a beautiful day. Clear. Sunny. Still cool in the early morning, with predicted highs in the mid-70’s. I ran a brief warm up. Ate another energy gel. Drank a bit more, then settled into a 6:30 pace group. My goal was to run the distance in under three hours. On the start line, I was anxious to get underway. I thought through all the things that had brought me here. The bucket list. Romeo. The pure competition. Doing something that I had never believed possible. The help and patience of friend and family. I thought through all the miles spent running, the gradual build-up over the summer, the hours spent on the road, the small miracle of remaining injury-free. I felt ready. I felt prepared. I felt strong. Then we were off and running. I worked my way through the start line congestion. I stayed calm. The first few miles ticked by. My legs felt rough, raw. I felt like I should be running harder. But I settled into a rhythm and it all started to click. On Sunday, I completed the longest training run of my marathon preparation. At 22 miles, it was a pretty meaty run and I did in two hours and forty minutes. I’ll have to run a bit faster than that to hit my target of a sub-three hour marathon. I felt okay at the end of the tun but in the days that followed my legs felt like they were coming apart at the joints and ligaments. I’m now fully into the taper. My longest run will be 12 miles between now and the marathon. I’m relishing the break, the chance to recover both physically and mentally. Meanwhile my concern turns to race day, the travel to Quebec City, the pre-race prep… and running the 26.2 miles at the necessary pace.